(Note: We are aware of sound issues on the on-demand coverage. For an update click here). To be notified when everything is fixed enter your email address. "If the body is healthy, and the weather good, I think on Sunday I will run the world record." 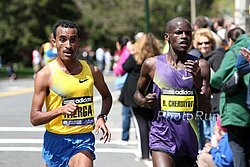 - London defending champion Tsegay Kebede, who will face a stiff challenge from World-Ranked #1 Marathoner Patrick Makau Sunday (watch live at 3:55 am Eastern, on demand after 9:00 am Eastern). "A sub-2:03:59 clocking wouldn't actually shock me. I'll tell you this - if Boston had rabbits and the field that is assembled for the 2011 London marathon was running with a time bonus on the line, I'd actually be a little surprised if someone didn't run the fastest marathon time ever recorded." 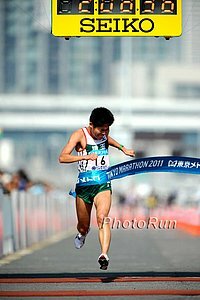 - LetsRun.com coaching guru John Kellogg on the perfect weather predicted for Monday's Boston Marathon. 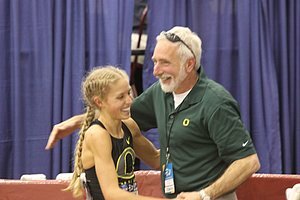 DID SOLINSKY JUST RUN 3:35? Coaching a team that doesn't care. Stephen Shay (Ryan's Brother) Is Running London And He Gets A Profile In Daily Telegraph American Mo Trafeh could get the American debut record. LRC Men's Preview: Heavyweights Kebede And Makau Vs. The Field Once again, London has assembled a tremendous field, showing why it is the most competitive marathon in the world outside of the Olympics. Patrick Makau, the #1-ranked marathoner in the world in 2010, whose worst marathon last year was a 2:05:08 win in Berlin, takes on the top competitive marathoner in the world not named Sammy Wanjiru - Tsegaye Kebede - plus five more of the 24 guys who have ever run sub-2:06 in the marathon. We break down the field and take a look at the Americans' (Patrick Smyth and Mo Trafeh) chances, including whether Trafeh can get American Ryan Hall's marathon debut record. 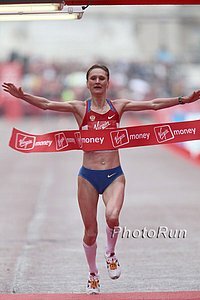 LRC Women's Preview: Liliya Shobukhova And The "Strongest" London Women's Field Ever Chase The Elusuive 2:20 Barrier Race Director Dave Bedford calls this without a doubt his strongest women's field and it's hard to argue against him. He's got the London champ, the New York champ, the Berlin champ, the World Champ, the Olympic Champ, and then a handful of others who may win, including the world half marathon record holder Mary Keitany. We break down the field, ponder whether we'll see the first sub-2:20 in three years (and wonder why women's marathoning has gone in reverse the last five years) and look at American Magdalena Lewy-Boulet's chances of a sub-2:25 clocking. Preview Of The 119th Harvard/Yale Dual Meet The Harvard men own a 59-48-1 series edge, but Yale has won every time since 2004. LRC The Week That Was This week, we investigate German Fernandez's Shoe-Gate, quote a 9th or 10th grader who says that more fans watch his 9th-10th grade meet than Leo Manzano, tell you why to be truly elite in the marathon you now need to be a sub-2:06 guy, and re-introduce you to Leilani Rios, the runner who was a national sensation 10 years ago when she was kicked off the Cal State-Fullerton track team for making a lot of money each night she worked. 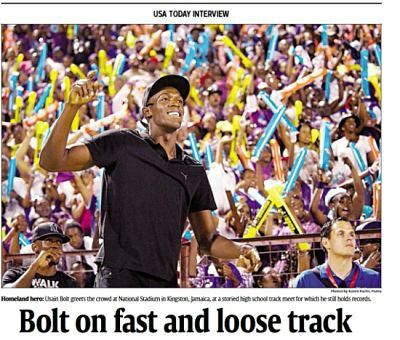 Meet Usain Bolt's Brother - Sadiki Bolt - Will He Too Soon Be A Famous Professional Athlete? He's 8 months younger than Bolt but cricket is his game and he's got some real talent but was sidelined by distractions when his brother became famous. Scientific Paper: Doping Varies Greatly By Country We are too cheap to pay the $35 to read it but wonder if it says Moroccans and Russian women and US sprinters are the worst. Sonia O'Sullivan Will Always Be At Home In Cork, Ireland - So She Might As Well Win The Local Marathon College age and don't know who O'Sullivan is? 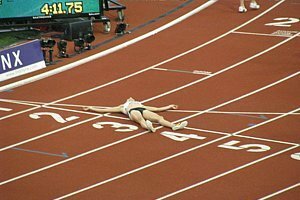 She starred at 'Nova and had every Irish record from the 800 through 13.1. Doug Logan, Rejoice: Brits Arguing Over How Many Track Medals They Should Win In 2012 The coach van Commenee says if they don't win 8 with at least one gold, he's gonna be a goner. LRC: Once In A (Marathon) Lifetime Weather Conditions Forecast For Boston On Monday The weather forecast is for near perfect weather with a nearly 20 mph tailwind, prompting the LRC coaching guru to say, "A sub-2:03:59 clocking wouldn't actually shock me. 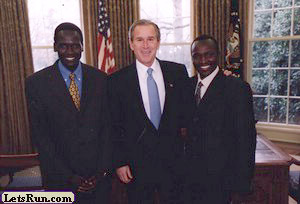 I'll tell you this - if Boston had rabbits and the field that is assembled for the 2011 London marathon was running with a time bonus on the line, I'd actually be a little surprised if someone didn't run the fastest marathon time ever recorded." Florence Kiplagat Ready For Her Marathon Debut The only question on her is if she is 100% healthy. LRC: Friday Press Conference: Ryan Hall Confident; Geoffrey Mutai Speaks On Kenyan System; Goucher, Davila, Cheruiyot Reveal Plans Interviews with Ryan Hall, Geoffrey Mutai, Kara Goucher, Desiree Davila - plus record holder Robert Cheruiyot discussed his calf injury. LRC Men's Preview: Stellar Top 3, Moses Mosop's Debut, And Ryan Hall Robert Cheruiyot went 2:05:52 on the Boston course last year and he's not even our favorite, as he faces the world's "strongest" runner, Geoffrey Mutai (the stud who averaged 2:05:08 in 2 marathons last year and then dominated the Kenyan XC ranks), NYC Champ Gebre Gebremariam and the debut of Moses Mosop. Plus, we give you Ryan Hall's chances and discuss his thyroid problem and parasites. 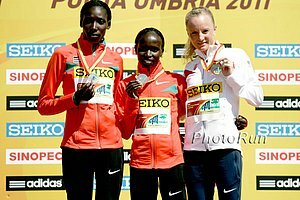 LRC Women's Preview: 10 Seasoned Marathoners Or Newcomer Florence Kiplagat? Former World XC and World Half Marathon champ and Renato Canova-coached athlete Florence Kiplagat (and the wife of men's debutant Moses Mosop) will battle 10 seasoned marathoners that have a chance to win. Who will come out on top? 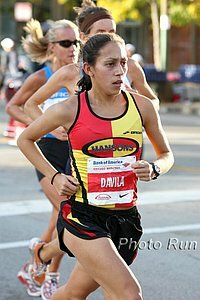 Does Kara Goucher have a chance? We tell you that and more. In our minds, a white former NCAA athlete might win, but her name most likely isn't Kara Goucher. *Washington Post Looks At Haile G's Comeback From Retirement, Which Begins Sunday In Vienna While the great one unretired, the article admits he's finally starting to wonder when he will actually retire. 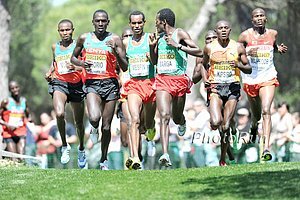 *Preview Of Vienna Marathon: Haile Gebrselassie Running Half And Paul Kirui Going For Marathon CR With Boston and London coming up, it's easy to overlook this, but the Vienna Marathon is also Sunday. Geb will be making his return in the half in his first major appearance since dropping out of the NYC Marathon. Greater Boston Track Club Coach Tom Derderian: "Athletic competition is not a democracy. Faster runners should be privileged." 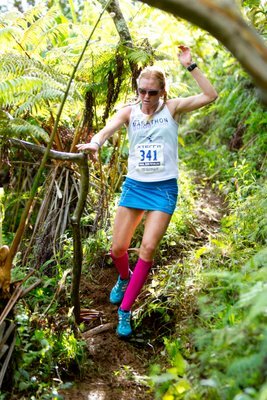 "My concern is that fast runners be guaranteed entry and not be tossed into a lottery or be rushed to make a deadline. Athletic competition is not a democracy. Faster runners should be privileged. The Boston Marathon was conceived in the tradition of the Olympic Marathon to be a footrace to see who's fastest." Boston Herald: Ryan Hall Says He's Going Into Boston Relaxed Without Pressure But that doesn't mean he doesn't have big ambitions: "You never know who's going to produce the biggest challenge ... So, you have to have your eyes open and have respect for everyone and be ready for a variety of runners. Hopefully, it's me." 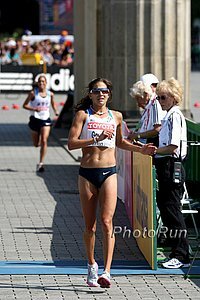 Kara Goucher Blogs On How Winding Down To Race Day Is Like "Closing The Door On A Little Chapter Of My Life"
Kim Smith: "I think it is a winnable race, and, if I won it, it would mean a lot." Husband-Wife Duo Of Florence Kiplagat And Moses Mosop Ready For Marathon Debuts In Boston (link fixed) Kiplagat is the reigning half marathon champ, whereas Mosop was a past runner-up at World XC. Kiplagat reveals she has an ongoing hamstring problem which doesn't hurt her too much on the roads. 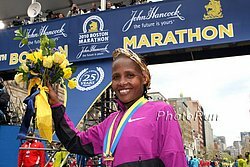 Boston Herald: Is Kenyan Dominance A Permanent Thing Or Is It Just The Latest String Of Countries Having A Great Run Once upon a time, Canadians were the best, then Japanese ... and as late as 1988, it was viewed that Kenyans couldn't win.